Blackstone Fortresses are a pretty big deal in Warhammer 40,000. They’re effectively Games Workshop’s equivalent to the Death Star; huge, unfathomably powerful space stations that can lay waste to entire fleets. 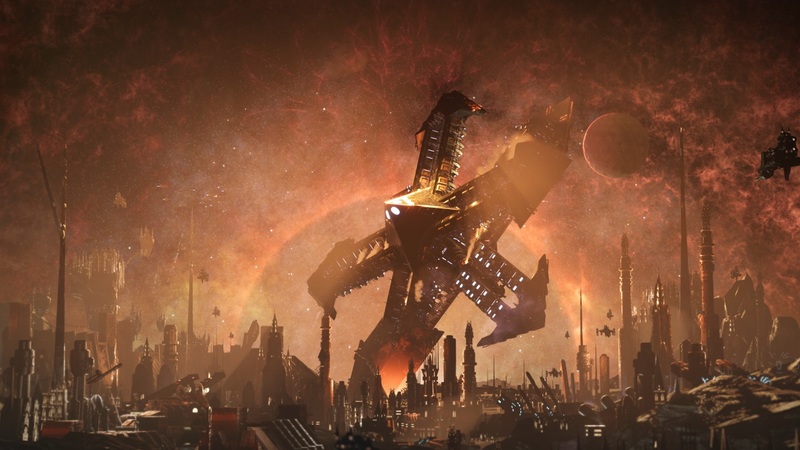 Battlefleet Gothic: Armada 2 starts with you destroying one of these things – piloted by the chaotic heretics of the 13th Black Crusade – by method of flying a heavily-armed cathedral into it. In response to their humiliating defeat, your enemy then hurls the smouldering remains of their superweapon at a planet, obliterating all but a handful of the world’s defenders. As you can see, in the grim darkness of the far future, there is only madness, absurdity, and very, very big guns. If you’re a 40K veteran, you may recognise the above tale as that of the Fall of Cadia. The planet was once vital to the Imperium of Man, as it guarded the only safe route to the Eye of Terror – a Warp rift from which the horrors of Chaos pour through. But in 2017, Games Workshop extinguished Cadia as part of the Gathering Storm campaign, which pushed the Warhammer 40,000 storyline further forward than perhaps any other event in the game’s 30-year history. 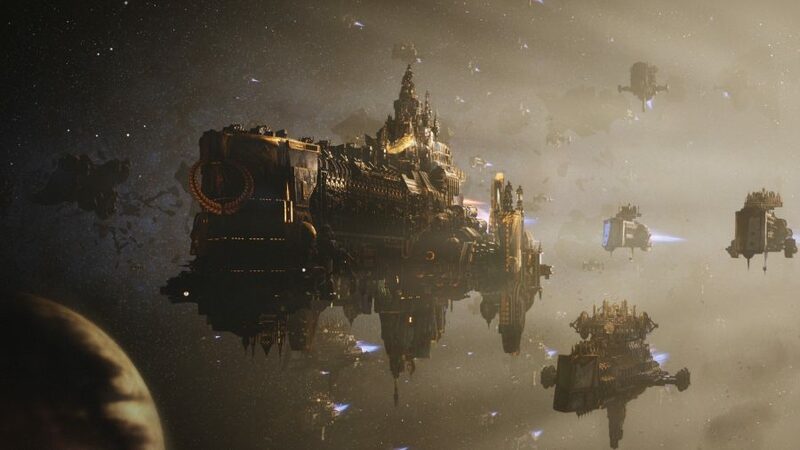 The Fall of Cadia was exciting when told through lore books and campaign rules, but with Battlefleet Gothic: Armada 2 we finally get to see it in explosive, visual form. 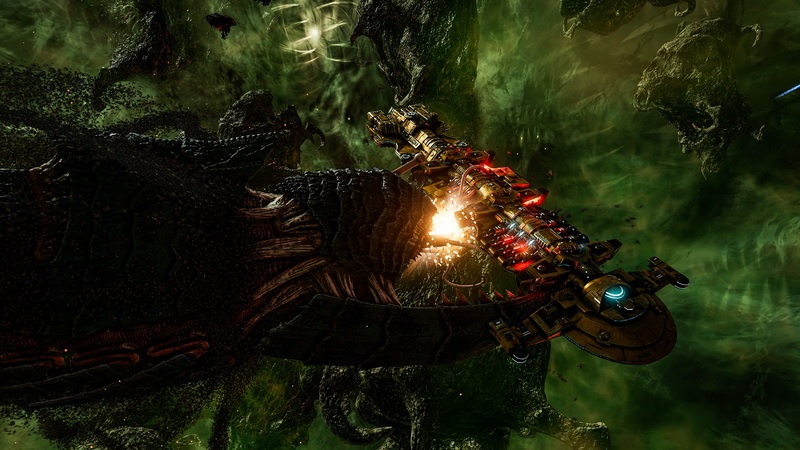 Few Warhammer 40K videogames are as intertwined with the lore as Battlefleet Gothic: Armada 2. As a tabletop player, it’s difficult to not get starstruck as an important character like the Imperium’s outspoken engineer, Belisarius Cawl, meets and schemes with Trazyn the Infinite – a Necron Overlord who, by Imperium mandate, he should execute on sight. The two put into action a storyline that spans across three campaigns, one each from the perspective of the Imperial Navy, the Necrons, and the grotesque Tyranid Hive Fleet. You’ll like that last one; their organic vessels literally chomp their foes in two. The Necrons and Adeptus Mechanicus work together in Battlefleet Gothic: Armada 2’s opening, as they attempt to use the Cadian Pylons to close the Eye of Terror once and for all. But these two factions haven’t always had aligned goals. Warhammer 40,000: Mechanicus depicts these two bizzare races at war in a fantastically weird XCOM-style tactics game. The narrative of these campaigns is spectacularly overblown, told via voiceover layered over animated artwork – the latter of which includes pieces taken directly from Games Workshop’s tomes. Seeing a moving version of the classic Horus Heresy art, with the Emperor facing off against his most favoured son, is a real highlight. Unfortunately, this nerd high doesn’t last indefinitely. The further you drill into the campaign, the more Armada 2’s limits are revealed. The campaign is, akin to the Total War games, a tale of two halves. At the strategic, galactic level, things are solid; your fleet travels from system to system, installing defenses, constructing new battle barges and capital ships. It’s unremarkable, but it works; a fine canvas for the more thrilling real-time space battles to stand out against. But there’s something holding the battles back from greatness, too. As I’ve previously noted in my preview of Battlefleet Gothic: Armada 2, every ship in the game is a joy to use. Shells erupt from broadside cannons, melta-missiles collide into bows, and piercing-bright warp beams flash as you deploy boarding parties onto the decks of enemy vessels. It’s a true fireworks display to behold. Such a display is made easy to achieve, too, thanks to a accessible collection of unit abilities that can be used to conduct reasonably complex strategies. But gosh, the fights can be drawn-out. And, depending on the objective, nonsensical. Too often, campaign missions are set up as capture point scenarios, in which you’re expected to simply moor your fleet in arbitrary circles plotted on the map, and hold them until you accrue enough victory points. This is fine in competitive multiplayer, where there’s no real need for theatre, but when playing the campaign I really can’t see how holding onto an area of space that’s relatively speaking the size of a peanut – a Brazil nut at a push – will help keep the tsunami of the Black Legion at bay. Is Abaddon sat at the bridge of the Krukal’Righ tallying up victory points? Hardly the behaviour of a man who goes by the title ‘the Despoiler’ now, is it? You’ll notice that this isn’t a full review; I’ve yet to play enough of Battlefleet Gothic: Armada 2 to come to a full conclusion. As such, I don’t want to claim that the campaigns are underbaked. But if what follows is anything akin to its opening hours, expect the narrative thrills and explosive spaceship engagements to come hand in hand with dull, repetitive mission structure and a serviceable strategic layer. It’s probably not enough to scuttle the whole experience, but I suspect Battlefleet Gothic: Armada 2 is best played in the same way as its tabletop progenitor: as a short-form multiplayer skirmish, where the tension is found in every missile barrage and boarding operation, rather than a galaxy-wide crusade.